David and I, enjoyed a lovely lunch at the Thai Buddhist temple on Mother's Day. that lead to suffering. He graciously revealed his method of purifying these dukkhas through mental analysis, mindfulness and discipline. Monk Tee eats one meal per day, sleeps on a narrow wooden plank and goes to sleep at 9PM and arises at 3AM. His austere life blesses him with boundless energy and a calm, peaceful demeanor and spirit. I love meditating in the Thai Buddhist temple. I can immediately sense the celestial vibrations radiating though the holy atmosphere. I recall walking down to the ocean with a young man. We both entered the ocean and swam along the coast. At a certain point I told the young man to feel the lower part of my body. To his shock and surprise I had a mermaid's tail. He looked at me stunned and went into an altered state. We continued to swim discussing spiritual matters. Then I stopped and looked at him and said. "Everything is inside of me." on us. The dream began to fade and I woke up. I discussed the dream with David that morning and we both agreed that the inner message was that we all have tremendous, untapped potential within us. The power of God is innate and inherent within us. To add icing to this dream, the following day, my daughter and I attended an award ceremony for her son. During the function, I mentioned my dream to her. She looked surprised and then said she had just posted a divine picture of a mermaid on her facebook page. 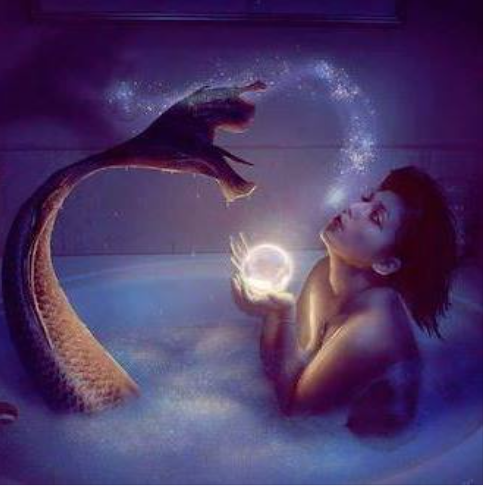 The interesting thing about this photo was that the mermaid was holding a huge pearl or crystal and jewels appeared to be gushing from her mouth. This only reinforced the message that we are made in the celestial image of God, the entire universe is within and without us, we just have to be mindful and cognizant of this eternal truth.